The Komunity Project is a surf initiative founded by Kelly Slater. Kelly’s involvement with the brand has seen great product developments. As an indication of just how good these developments have been, they’ve been taken up in collaboration by 4 World Champions and a host of World Surf League competitors and Chargers. If you want your surfing to benefit from Kelly’s expertise and that of elite surf Professionals check out Komunity’s gear. 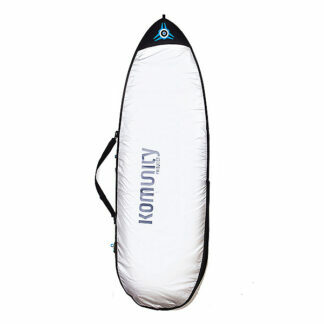 Komunity’s range covers your essential surf accessories. Each of their accessories gives you something extra in terms of performance, value, functionality and style. Some of the surfers who contribute to Komunity include 4 World Champions: Kelly Slater, Adrian de Souza, Barton Lynch and Mark Occhilupo. Chargers include Silvana Lima and Nicky van Dijk, Wiggolly Dantas, Clay Marzo, Bede Durbidge and surfing’s statesman Simon Anderson. 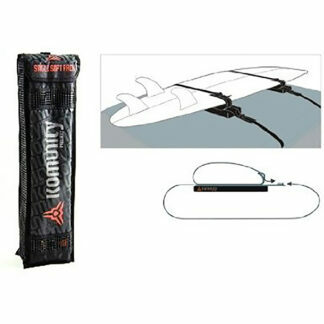 From leashes, to traction, board bags and travel products, Komunity has redefined and redesigned surfing essentials so you get the best experience and result. Let’s check out the differentiation in their product set. Komunity has a leash series that bears Kelly’s initials, the KS1.1. The 1.1 being representative of Kelly’s 11 World Titles. What makes this leash so good is that it’s all one piece of urethane. The end pieces, that are most prone to breakage on a leash, have been removed. This one piece design greatly reduces the chance of breakage and bulk is also removed. So you get a super beneficial feeling of freedom while surfing. The latest version of this leash has Triple Swivels, so the chance of the leash twisting or getting caught around your fins or feet is greatly reduced. The highest grade urethane is used so along with reduced bulk and being super lean the cord has great strength. To provide some indication of Komunity’s faith in its strength the KS leash series comes with an unmatched 3 years warranty! 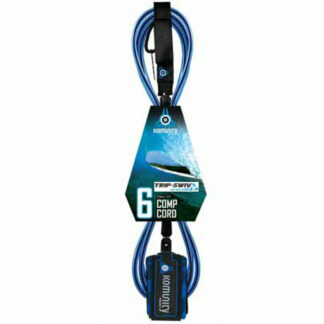 The KS 1.1 6′ Ultimate Super Comp leash is only 5.2mm in diameter so is a dream to surf with. 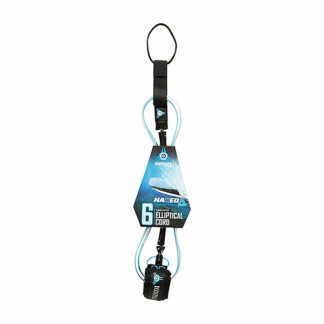 This leash scales up for bigger waves and boards with 6mm and 7mm diameter and 7′ and 8′ lengths. The freedom felt in the water and overall usability of the leash has to be experienced to be believed. Another unique first is Komunity’s Naked leash. It’s an elliptical shape so is only 3.5mm thick on one side. It’s designed to skip out from under your board so you don’t get drag on the wave and it doesn’t hinder your surfing. There’s a full range of leashes for longboards and SUPs including great value entry offerings so every aspect of your surfing is covered. Simon Anderson, the designer of the Thruster 3 fin surfboard knows fins and knows what works. The Komunity fins are the only fins Simon puts his name to so they’re something special. 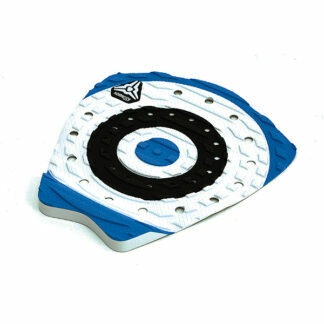 Simon’s fins come in Quads, SA1.0 and SA4.0 (for big surfers), and thrusters SA2.0 and SA3.0. They’re produced with a foam core so lightweight with a special-blend glass resin construction. Simon’s fins feature a wider base that extends up the fin before flowing into a generous tip. So they’ll give your surfing heaps of drive. WSL competitor Nikki Van Dijk has her signature setup. This includes her fin with a medium base, reasonable rake, curving back to a reduced tip. This rake gives good projection for down the line waves. At the same time the reduced tip allows you to have release, you can break free of the flow into big manoeuvres. Kelly Slater also has a comprehensive offering of fins and Komunity is the only place you can get them. These aren’t new fin templates but the same used throughout Kelly’s World Title wins. 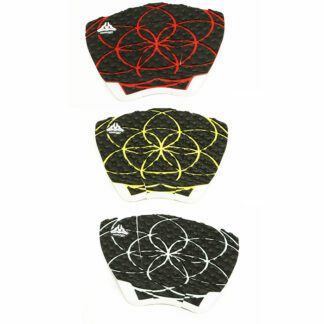 So you get the opportunity to try Kelly’s same fins, both in FCS and Futures formats. The KP2.0 is upright with low sweep. So it gives you good top to bottom surfing with sharp short radius turns. Great for beach breaks. The KP3.0 is a finer fin with more rake and a refined tip. Kelly says it’s for a long wall waves. Interestingly Kelly explains that in his Thruster setup he always rode with the KP2.0 rear fin, alternating his front fins between his KP2.0 and KP3.0 style fins as required by the conditions. Along with the Thruster sets there’s also Quad sets of both of Kelly’s fins, along with nubster rear fins for 5 fin setups. Komunity call these small rear fins Thumb Drive fins. 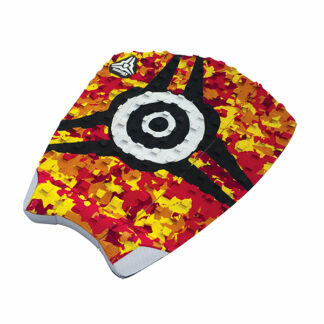 If you’ve seen Kelly surf with one of these you’ll know they can help do amazing things to your surfing. If you want to experience for yourself some of Kelly’s magic, and what Simon’s and Nikki’s fins can offer your surfing, Komunity has what you need. Along with these signature fins there’s classic longboard fins for everything from old school carving to speciality nose riding. In the cycles of surfing front grip was one of the big things. 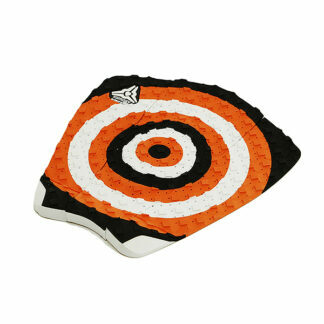 It’s fully functional and can greatly benefit your surfing as attested to by Barton Lynch. Barton won the Pipe Masters and World Title using his signature front grip. Komunity now offers you Barton’s updated front grip as well as rear tail pad setup. Komunity has taken Barton’s grip and given it a different purpose-designed texture. It’s softer, with lots of small perforations. So your chest gets a softer paddling contact-point. Once on your feet your toes can grip into the pad, it’s a spongy positive texture. World Champions Mark Occhilupo and Adrian de Souza along with numerous chargers have given their input to signature tail pads to give your surfing a performance boost. Mark Visser a big wave charger has his signature pad designed with special larger and elevated squares so you get maximum grip in critical situations. 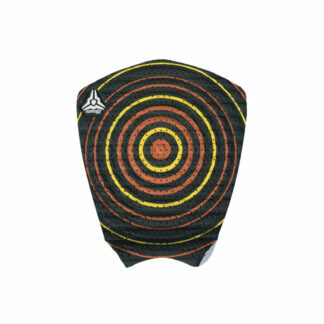 There’s also an entire bullseye pad series based on Kelly’s design. Along with shortboard traction there’s grip for longboards and SUPs. As an indication of their commitment to quality Komunity use 3M adhesive on all their grips. For any type of travel, day trips to world tours, there’s a Komunity boardbag and travel accessory that’s feature packed and great value. While there’s no signature models the World Tour elitewho do the most travelling and have the greatest necessity for the safety of their equipment, have provided plenty of design input. Unique features include the first in-bag anti-wax strips. These are super handy as your wax melts off in your bag and then transfers to other boards and to their bottoms reducing performance. These strips prevent this problem. Construction throughout is super rugged with the renowned YKK brand zips used for maximum durability. Thermal flow vents are featured. Padding of the shoulder and carry handles is generous and the bigger bags have plenty of grab handles strategically positioned. 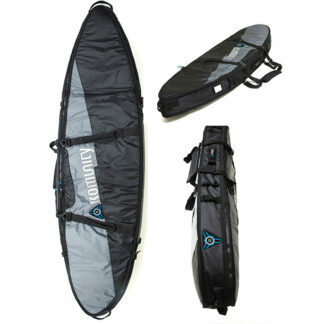 Along with bags for your surfboard, Komunity luggage includes backpack and carry bags. So wherever you roam all your gear can be carried safely, compactly and stylishly. 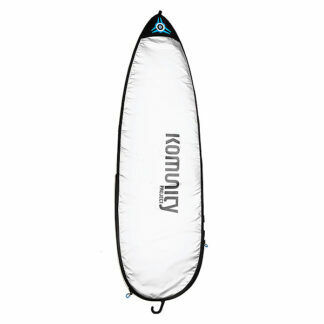 Komunity has great surfing essentials, many signatured by World Champions, a proven part of their success. 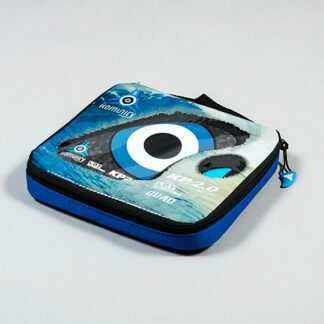 Komunity has made these products available so they can be part of your surfing success too. Products designed by surfing’s best of the best, Kelly Slater, Simon Anderson, Barton Lynch and other WSL World Champions and chargers will raise your surfing performance. If you’re making a choice on what’s out there, Komunity’s products are proven to give you results. To check all our great Komunity Project gear and buy online click here.